This handsome knife turns cold, hard butter into soft, sumptuous ribbons that won’t tear your toast. 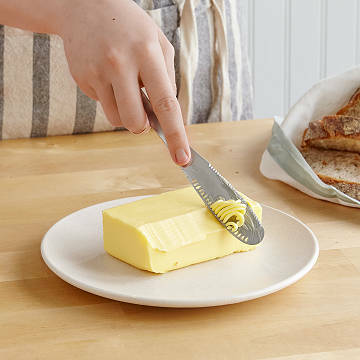 Effortlessly gliding across cold butter, this knife carves soft ribbons that spread gently, without tearing your toast. No more "softening" butter in the microwave only to have it melt, or biting into big slabs of it that refused to spread on your pancakes. Perfected by butter enthusiasts who prototyped a plethora of models, it does an equally beautiful job on both dairy and vegan versions. Plus, the cool, conversation-starting butter curls just might be a sensation at your next carb-y party. Dishwasher-safe stainless steel. Made in China.